REDARC’s fixed solar panels are high-quality monocrystalline solar panels designed to be attached to the top of your caravan, RV or camper-trailer. Ideal as solar powered battery chargers, they are easy to use and will help you stay self-sufficient on your next camping or driving adventure. The solar panels are designed with the rugged Australian terrain in mind and are able to withstand Australia’s harsh conditions and extreme weather. The double channel aluminium frame creates a strong setting for the solar panels, and the tempered glass coating provides extra protection from the elements. The fixed solar panels can be mounted using ABS plastic mounts on your RV or caravan roof, and will keep them secure and reduce wind resistance. They can also be mounted using aluminium angle mounting kits that allow you to adjust the angle to better capture the sunlight. Available in 50W, 80W, 120W, 150W, the REDARC fixed panel is the solar powered battery charger for every energy requirement. They can be used to charge standard Lead Acid, Calcium content, Gel and AGM type 12v batteries and work best when combined with a REDARC BCDC or Battery Management System with in-built solar regulator. The REDARC 50W Monocrystalline Solar Panel is a standard monocrystalline flat panel designed to capture solar energy to keep batteries charged throughout the day. The REDARC 80W Monocrystalline Solar Panel is a standard monocrystalline flat solar panel designed to capture solar energy to keep batteries charged throughout the day. 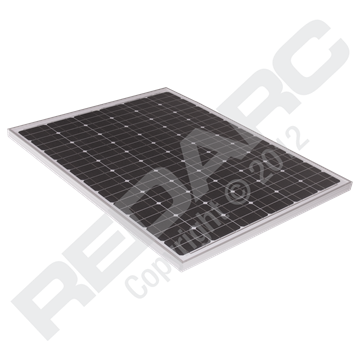 The REDARC 120W Monocrystalline Solar Panel is a standard monocrystalline flat solar panel designed to capture solar energy to keep batteries charged throughout the day. 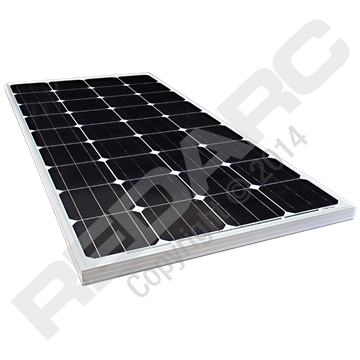 The REDARC 150W Monocrystalline Solar Panel is a standard monocrystalline flat panel designed to capture solar energy to keep batteries charged throughout the day.